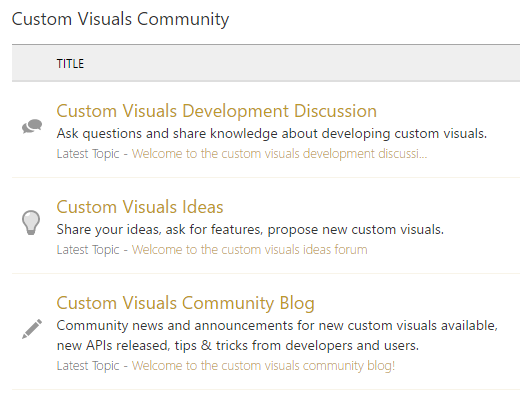 Custom visuals are all about the community, whether the community developers who drive the awesome visuals in the gallery, create visuals privately for their organization use, or enthusiastic users who create beautiful reports using custom visuals and request more features and more visuals. 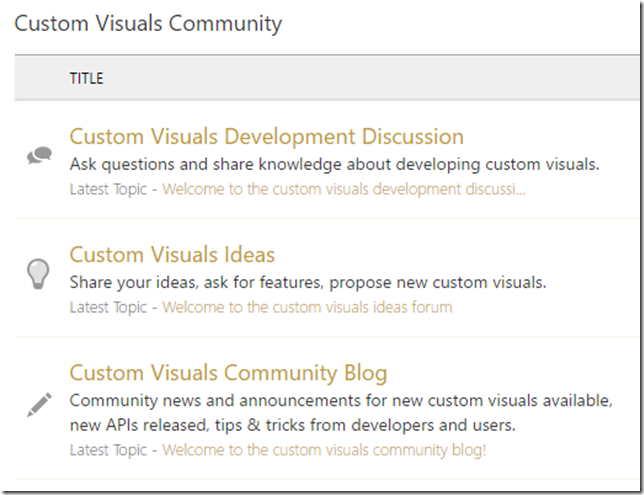 We love to see the excitement and energy that you bring to the community, so we are very excited to announce that custom visuals now have a special place in the Power BI community site, to share knowledge, ideas and news! Custom visuals ideas – Ask for new custom visuals, new features for existing custom visuals, or any idea you may have regarding the platform or specific visuals. Get in there and start filling the forums! we want to hear your voice, learn from your experience, read your opinions.